I have been a proponent and staunch user of Contact Form 7 for many years. It’s free and powerful, but not very easy to use for my clients. But this spring, I received an invitation to try out the new WPForms Premium WordPress form creation plugin. WPForms is a paid plugin, it’s very powerful, and it’s very easy to use, even for my clients. The following WPForms review looks at the advantages and disadvantages of this plugin. I have used only four WordPress form plugins: Contact Form 7, Gravity Forms, Jetpack Contact Form, and WPForms. If you need only a simple contact form, Contact Form 7 and Jetpack Contact Form are more than adequate for the job, and they are free. But if you want a full-featured, easy-to-use WordPress form plugin, WPForms or Gravity Forms are great choices. These two WordPress form plugins are very close in features and ease of use. Gravity Forms currently has a LOT more plugins, but WPForms is continually adding new features and plugins. Note: There is a free version of WPForms on WordPress.org. You might find the free version is all you need. But to get all the features and plugins, you need the paid version. Below is a list of the main features of WPForms. Everything about WPForms is easy. If you are a developer, this might not be important, but if you want to provide clients with a tool that makes it easy for them to create a form, WPForms makes it simple. Furthermore, even though I have used Contact Form 7 for years, I didn’t realize how much time I was wasting creating complex forms. With WPForms, I can create complex forms 3 times quicker. WPForms has both Honeypot and Google ReCaptcha spam protection built in. Honeypot is more user friendly because the user doesn’t have to enter any code. If you are still getting spam with Honeypot turned on, you can add Google ReCaptcha. WPForms stores all form submissions unless you tell it not to. You can turn this on or off in each form’s settings. In addition, you can download a csv file of each forms submissions. You can easily create a payment or donation form to collect, for example, invoice payments or donations. It took me about 5 minutes to set up an invoice payment form and connect it to Paypal. You can also create products. Unfortunately, there are only two payment gateway plugins: PayPal and Stripe. I hope WPForms will add Authorize.net and Paypal Pro, two industry standard payment gateways for accepting credit cards directly. Conditional logic allows you to display or hide fields based on a user’s interaction with the form. For example, if you have a form with a select field for Gender: Male or Female, you can use conditional logic to show different fields based on the user’s choice. 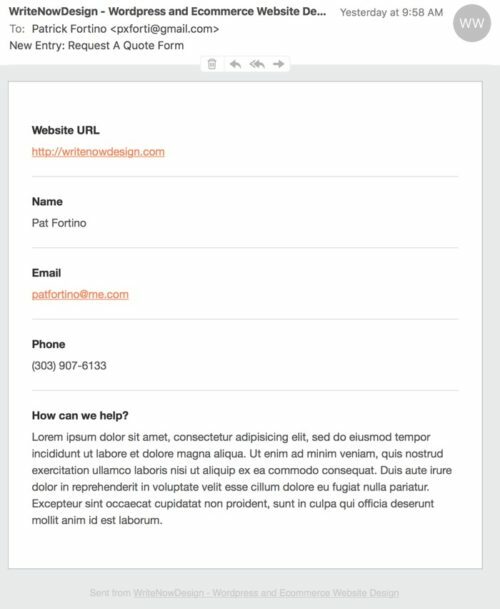 It’s easy to create a newsletter signup form with WPForms and connect it with MailChimp, GetResponse, Campaign Monitor, or AWeber. I was able to create a newsletter signup form with WPForms and connect to MailChimp in about 5 minutes. The ability to import or exports forms was just added. This is a great feature if you build a lot of sites. You can create a default contact form or request-a-quote form and quickly import it. You can preview the form as it will look on your site. This is a nice feature. Gravity Forms lets you preview forms, but it does not show you the form with formatting, only in a default format. WPForms includes the ability to create multi-page forms. This feature is very useful if you have long forms. You can split the form into multiple pages to make it less intimidating to the user. This is a great option of you’re a developer. Buy the license once, essentially pay for two years at once, and get a lifetime license. WPForms has excellent email support. I usually get an answer to my question within an hour. WPForms is off to a great start with its list of features and ease of use. I am going to try it for a year and hope they add more features to make it a direct competitor to Gravity Forms. Although Gravity forms has a lot more features and plugins, WPForms has a lifetime license.